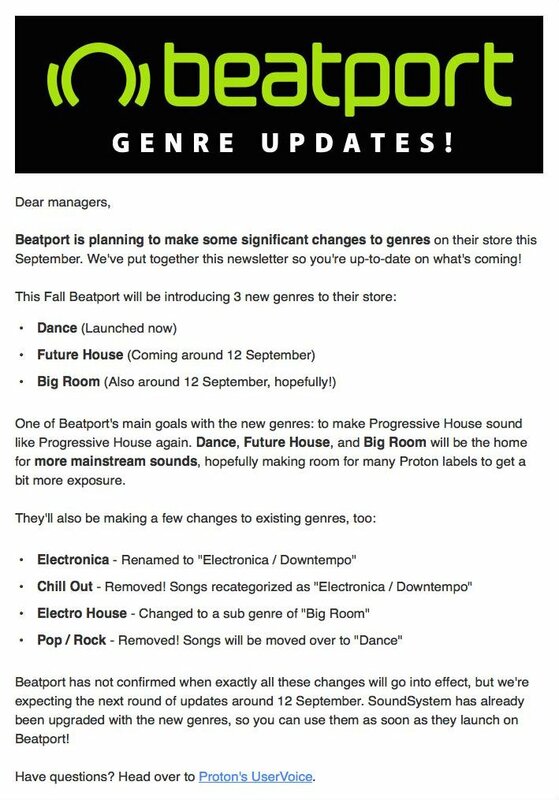 Beatport has recently released an announcement regarding how they will be updating their genres. Currently, a new main genre of Dance has been updated to the site. On September 12th, a new subgenre of Future house will be added, and there is hope that the subgenre Big Room will be ready that same day. The hope is that with these new sub-genres the spectrum of Progressive House will become more of just that, progressive house. Currently, Progressive House seems to be the cover-all for music they are unsure of how to categorize otherwise. As for existing genres, there are plans to change the titles to make them more inclusive. “Electronica” will be getting renamed to be “Electronica / Downtempo” to include multiple areas including the “Chill Out” subgenre. “Electro House” will be getting changed to the “Big Room” category, which is why there is hope for a quick transition. Finally, the category Pop / Rock will be getting removed from Beatport. Those songs will be getting added to the “Dance” category.